A man (Rufus Sewell) wakes up in a tub full of cold water. He’s a resident in a hotel but has no memory of checking in there, let alone living there for the past three weeks as the desk clerk insists. He gets a phone call from a man claiming to be his doctor (Kiefer Sutherland) who tells him he must leave the hotel as there are people looking for him. ‘People’ is somewhat of of an understatement. The Strangers look like walking corpses dressed all in black and have extraordinary psychokinetic powers. The man leaves and begins a search for his identity, pursued not only by The Strangers but by Police Inspector Bumstead (William Hurt) who suspects that the man is the maniac responsible for a string of horrifying murders. The man eventually discovers his name is John Murdoch and that he has powers of his own that enable him to evade The Strangers. Armed with these powers he sets out to discover the truth of his origins. Did he really murder six prostitutes? 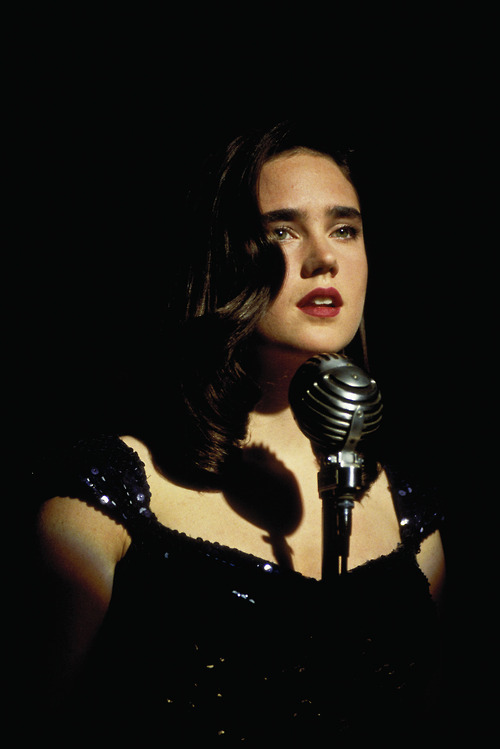 Is the sultry torch singer Emma Murdoch (Jennifer Connelly) truly his wife? Why is he tortured with memories of his youth living in the coastal town of Shell Beach and why is it nobody can remember how to get there? Why does everybody in this city of eternal night, this DARK CITY fall asleep at midnight? Why do The Strangers use their power to rearrange the very city itself and swap identities of the sleeping inhabitants? If you’ve never seen DARK CITY I wouldn’t dream of spoiling the fun of you discovering the answers to those questions and many others. Because DARK CITY is just as much a neo-noir detective story as it is so many other genres. It’s also a horror movie. A live action graphic novel. A science fiction movie. A suspense thriller. In a way, it’s even a superhero origin movie. It’s so many different genres blended together and amazingly, they all work thanks to the utter brilliant screenplay and direction. I know people who go on and on and on about how great “The Crow” is but they can keep that movie. Just give me DARK CITY which for me is the best thing Proyas has directed so far. The visual look and texture of this movie is just as unique as the story. The architecture of the Dark City itself looks European mixed with Art Deco and German Expressionism. It’s a look like no other city in a movie has ever has. It’s even more impressive when you find out that it was all constructed on a set. The production design alone is worth seeing the movie. 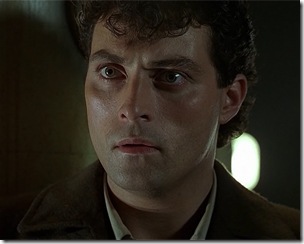 This is the first movie I ever saw Rufus Sewell in and right from there I said to myself I would have to keep an eye on this guy. He’s one of those actors who I just can’t take my eyes off when he’s on screen. He’s always doing something interesting with his eyes, his body or his hands. And he’s one of the few actors who I can actually see thinking. He’s flat out terrific in this movie. Kiefer Sutherland is equally terrific. People who only know him as Jack Bauer really need to watch DARK CITY to see just how good an actor he really is. William Hurt has a lot of good scenes as Inspector Bumstead. I liked his relationship with a uniformed policeman who admires Bumstead and who acts as his unofficial sidekick in police work. Bumstead has long had his own suspicions about the origins of the city as he reveals when he asks Emma Murdoch questions about her own memories. And as usual, I can’t say a bad word against Jennifer Connelly. Not only is she gorgeous as hell she’s an amazing actress as well. What else can I say? Not much else. Chances are most of you reading this have already seen DARK CITY and so you know what I’m talking about. As for those of you who haven’t. Please do yourself a favor and this weekend get yourself a Blu-Ray of DARK CITY. 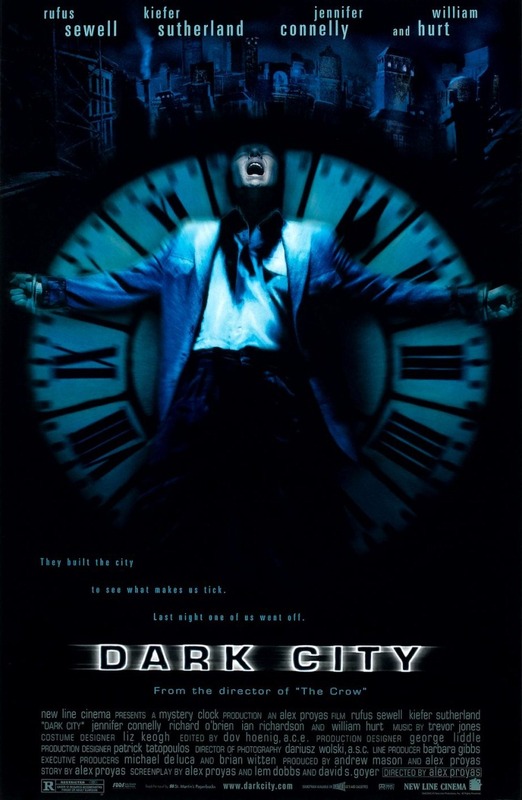 I’m advising you to get the Blu-Ray because not only does DARK CITY look astounding in Blu-Ray, it also has a commentary by Roger Ebert who was a major champion of this movie from Day One. ‘Visionary’ is a word thrown around far too often when describing movies but in the case of DARK CITY it’s more than well deserved. It’s one of the most imaginative and fascinating movies I’ve ever seen. It tells a great story and does it in a memorably thrilling and original way. Enjoy. It’s one damn excellent movie. Anyone who hasn’t seen it yet, go see it. It’s worth it. DARK CITY is a movie that even today hasn’t been seen by a lot of science-fiction movie fans as, like “Equilibrium” it got unfairly tagged as a ‘rip-off’ of “The Matrix” when actually both DARK CITY and “Equilibrium” are by far better movies than “The Matrix” Thanks for reading and commenting and I’ve been reading your blog as well so look for comments from me soon! OMG I didn’t know anyone knew this movie. I’ve literally shown it to dozens of friends who consider themselves fans of the genre and none of them had seen it or even heard of it. It had the misfortune of coming out the same time as The Matrix and nobody really saw it, but it was so good! Nice blog, I only just found it but I like the content, it’s certainly right up my movie-loving alley! Either way, consider me a new follower, looking forward to reading more!